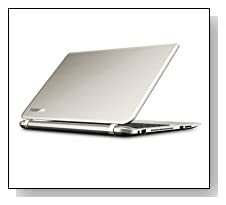 Brushed aluminium finish Toshiba Satellite S55-B5258 is one of the most recent release 15.6 inch laptops by the Japanese technology giant Toshiba with the top of the range Intel i7-4710HQ processor, 8GB memory, 1TB hard drive and a few unique modern day features. It is designed for improving your productivity at work or school and giving you a great multimedia and entertainment platform: Fast, powerful and efficient for anything you’d like to do on a daily basis. 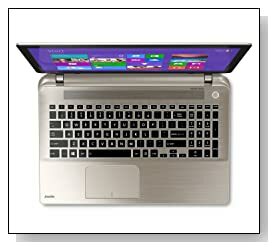 Toshiba Satellite has the Haswell Intel Core i7-4710HQ processor (6M Cache) with a base speed of 2.5 GHz that can go up to 3.5 GHz whenever needed with the Intel Turbo Boost Technology 2.0 (stays at 2.5 GHz for less demanding work to save battery life and to extend the processor life), 8 GB DIMM RAM for superior multitasking, a massive 1024GB Serial ATA hard drive- storage at 5400 rpm rotating speed- standard speed but fast and the latest 64-bit Windows 8.1 operating system pre-installed so you don’t need to upgrade from the Windows 8. Intel i7-4710HQ has the hyper threading function despite being a quad-core processor so it can handle as many as 8 threads to make good use of the CPU and you can work on the most demanding programs- media management, content creation, playback or play the latest games easily but you’ll need a more advanced discrete graphics card for that as you’ll be restricted with the Mobile Intel HD 4600 graphics in advanced games at high settings, but it lets you play older titles at high settings with no problems. 15.6 inch diagonal HD TrueBrite non-touch display with 1366x768 pixel resolution and Intel HD 4600 graphics offers decent quality images with natural colours. Although it is not Full HD, the HDMI port that comes with it is a 4K Ultra HD with 3840 x 2160 pixel resolution to give you 4x the picture resolution you’d get from Full HD content- on the 4K televisions. The 4600 graphics card offers an overall 30% faster graphics performance than the regular Intel HD 4000. Sound is great- rich, loud, precise and immersive with the DTS Sound technology, Harmon Kardon stereo speakers and Slipstream port that helps decrease distortion for when you’re playing music, videos or games. Intel WiDi wireless display allows you to stream multimedia from the web or hard drive to your large screen HDTV wirelessly. There is no DVD Drive on the brushed aluminium silver Toshiba Satellite being such a thin and lightweight machine with only 4.8 lbs weight and 0.93 inch thickness- 10.20 x 14.96 x 0.93 inches are the exact measurements and not many laptop computers include the DVD Drive these days and you can always connect a low-cost external DVDRW that you can get with the purchase of this Toshiba. And you’ll find the other necessary connectivity ports, such as the ultrafast 802.11ac wireless, Bluetooth v4.0, 10/100/1000 Gigabit Ethernet and RJ-45, 1 x USB 2.0 port and 2 x USB 3.0 ports (with Sleep and Charge function that lets you charge your smart phone or tablet when it is in sleep mode or turned off), an HDMI port, an SD Media Card Reader and a HD Webcam with an integrated microphone. Conclusion: Toshiba S55-B5258 (PSPRBU-001001) is not only a good-looking, light and slim machine but a great smooth performer- fast and powerful for how much it costs as well. It has a premium feel with the brushed aluminium finish and modern design, the quad-core i7-4710HQ is a high-end 4th generation processor with hyper threading and turbo boost, keyboard is backlit and ergonomic, has a 4K Ultra HD HDMI port, sound is superior with the Harmon Kardon speakers and DTS and the USB Sleep and Charge and Intel WiDi functions are very convenient to use. It is not suitable for playing the latest 3D games at high settings if you are a gamer but it is fine for older games at high, simply because it has an integrated graphics card rather than a discrete GPU, not because of the CPU. Great value for money!